Over the last two decades automatic facial expression recognition has become an active research area. Facial expressions are an important channel of non-verbal communication, and can provide cues to emotions and intentions. 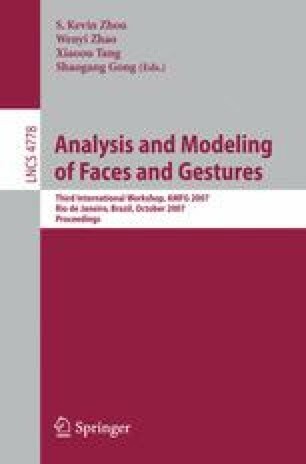 This paper introduces a novel method for facial expression recognition, by assembling contour fragments as discriminatory classifiers and boosting them to form a strong accurate classifier. Detection is fast as features are evaluated using an efficient lookup to a chamfer image, which weights the response of the feature. An Ensemble classification technique is presented using a voting scheme based on classifiers responses. The results of this research are a 6-class classifier (6 basic expressions of anger, joy, sadness, surprise, disgust and fear) which demonstrate competitive results achieving rates as high as 96% for some expressions. As classifiers are extremely fast to compute the approach operates at well above frame rate. We also demonstrate how a dedicated classifier can be consrtucted to give optimal automatic parameter selection of the detector, allowing real time operation on unconstrained video.